Tom Stoppard's The Coast of Utopia 2002 trilogy of plays and Abel Gance's 1927 biopic Napoleon have a great deal in common: They both portray famous revolutionary European figures and explore the sociological, political and personal factors that influenced their actions, are meditations on humans' ability to create and adapt to change, and are both rather long. The Coast of Utopia consists of three, three-hour=long dramas; Napoleon is five and a half hours long. I caught the first part of The Coast of Utopia, "Voyage," in an expert production by Patrick Dooley for The Shotgun Players on Friday in Berkeley. On Saturday, I spent most of the afternoon and evening in the company of some 3,000 people at The Paramount Theatre in Oakland for Kevin Brownlow's staggering restoration of Gance's masterpiece with musical accompaniment provided by the Oakland East Bay Symphony performing, exquisitely and with impressive stamina, a score created and conducted by Carl Davis. The film, presented by the San Francisco Silent Film Festival, represents the most complete restoration of Napoleon ever witnessed in modern times. Seeing both of these artistic efforts in such proximity inevitably caused me to think about the distance separating these artistic portrayals of revolutionary activity in previous centuries and what revolution amounts to in our own times. Both Stoppard and Gance create intensely human stories out of historical figureheads. The likes of Napoleon, Marat, Robespierre, Danton, Bakunin, Stankevich, Chaadaev and Belinsky leap out of the history books with their sabers flashing and their appetites growling. The works I saw this weekend both embody the spirit of the revolution in another way: Their mere existence speaks to the passion, commitment and sheer hubris that it takes to even create art on this scale. 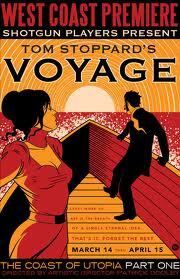 For a small company like Shotgun Players to pull off a feat like "Voyage" is an act of defiance in itself. The piece employs 21 actors, who all moved about Nina Ball's simple set composed of malleable partitions with graceful fluidity. This is no mean feat considering the modest proportions of The Ashby Stage where the run is taking place. I felt like I was watching a world-class soccer team or a pack of Navy seals execute a critical mission. The story-telling is all strategy, just like a crack military operation. 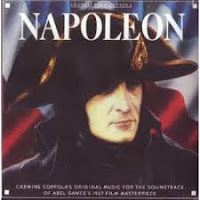 As for Napoleon, the idea that such film could have existed in the early days of cinema beggars belief. The whole thing is shot on such an intimidatingly large and lush scale that I am still reeling from the experience. That the filmmaker cast himself in the cameo role of Saint-Just, the French Revolution's most cold-blooded leader, is decidedly un-just. Gance's achievement is nothing short of Napoleonic. It's hard to imagine that our contemporary world of Tahrir Squares and Occupy Movements will provoke such memorable portrayals in art a hundred years from now. But who knows. One of the things that struck me about Gance's treatment was the presence of comedy, positioned at one end of the active spectrum, and poignancy on the other, with heroic self-possession of the protagonist at top dead center. The three camera effect was stunning in Epoch IV. Yes, a computer could cobble those into a more seamless image, but the enormity that was achieved in this extended "cast of thousands" scene was palpable, particularly when those on horseback cantered through the foreground. The only scene I could think of that was remotely like it is the depot scene in Gone with the Wind, where the camera pulls far back and above to give the visual its enormity. In "Napoleon", you are given the full impact all at once for an extended period of time, with movement threading through it to prove it is all happening at once. This must have been an unbelievable experience for the first audiences who saw it. Even as jaded as I feel I am, having been exposed to the wonders of modern technology applied to the cinematic art form, it was an astonishing thing to see. The long shots were incredible. The storm on the ocean scenes were breathtaking--hard to believe it was all done with a mock-up boat in a pool! The real hero of the film is Gance, particularly in terms of the creativity he applied to his cinematography. I think he might have portrayed Saint-Just because the character was such a rotten person--the attraction to such characters seems to be a constant theme among actors. I was palpably moved to see the the parallels of the reign of terror and the use of fear and government condoned murder through history into the present day.